For me, one of the highlights of the first few months of the App Store was Major League Baseball Advanced Media’s MLB At Bat 2008 edition ( ), which provided live linescores and in-game video highlights for every Major League Baseball game. Even better, an early-September update added live access to pitch-by-pitch details and boxscores, addressing the app’s biggest omission. Live game audio is great, even when the station names are confusingly reversed. This is not to say that, with audio access and pitch-by-pitch data finally available on the iPhone, that MLB At Bat 2009 is perfect. I found that it crashes occasionally, and the audio controls slide down over the top of the scoreboard, blocking the top of the list of games until you tap the Audio button to hide the controls. The game audio works fine, though nobody will mistake it for a pristine radio broadcast. Some of the audio sources I listened to sounded pretty good; others were overcompressed and very difficult to listen to. The low bit rate of the audio does serve users of the cellular network well—I was able to listen to a game on a 3G network, though occasionally the audio would pause or stop altogether. On a wi-fi network, the audio stream was rock solid. It would sure be nice if a higher-quality audio stream was available for users on wi-fi networks. The act of choosing which audio stream to tune in is more confusing than it should be. On opening day, the call letters of the team radio stations were matched with the wrong teams—for example, San Diego was listed as being broadcast on Dodger flagship station KABC, while the Dodgers were listed as emanating from Mexican (and Padres) broadcaster XPRS. There was no way to guess which was which without trial and error. Even two days after opening day, I found one game that claimed to have a visiting audio feed via the team’s TV station. Listening to a TV audio feed seemed weird enough, but when I tapped on it, what I got was the home team’s broadcast. I also saw several instances where only one team’s audio was available, which is a bit disappointing. There also appears to be no support for alternate broadcasts, such as Spanish-language radio. But while I’ve got a few quibbles, this app is just about the coolest thing a baseball fan could hope for. I can listen to any baseball broadcast (including those from my local teams) on my iPhone, whether I’m at my desk, on the bus, or even mowing the lawn. Throw in quick access to the latest scores, linescores, pitch-by-pitch details, and live boxscores, and MLB At Bat 2009 is pretty much a no-brainer for any baseball fan who loves the game and listening to it on the radio. 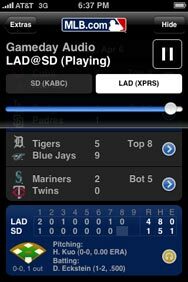 MLB At Bat 2009 is compatible with any iPhone or iPod touch running the iPhone 2.x software update.